Why Didn't We See the Russian Asteroid Coming? 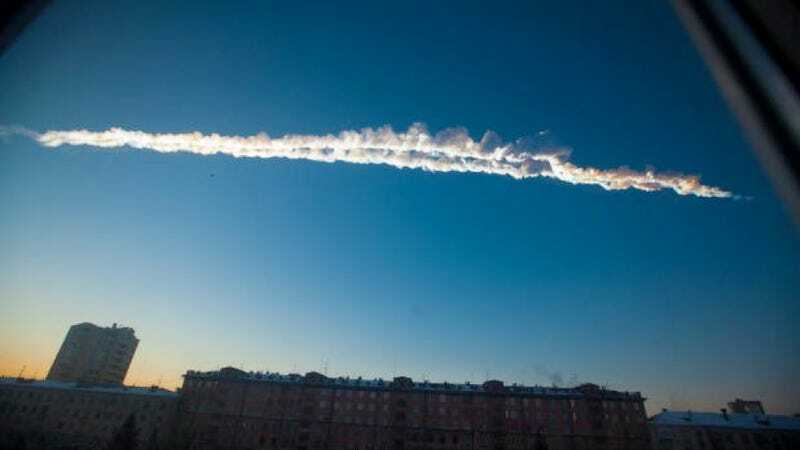 Early this morning, a fireball blazed over the Chelyabinsk region in Russia, shattering windows, collapsing roofs, and injuring hundreds of people. Given that it was one of the biggest meteors to hit Earth in possibly a century, why didn't we see it coming? For answers, we turned to NASA's Amy Mainzer, a scientist who works with the space agency's Near Earth Objects (NEO) program, and one of the main researchers on the NEOWISE satellite project to map NEOs in the sky. We are quickly learning a lot about the Russian fireball. It was pretty small - only about 15 m and about 7000 tonnes - and that's why it wasn't detected. This object wasn't seen earlier because it was really faint, and it might not have been visible to observers in the night sky. Most of the survey efforts have been very successful in finding the largest asteroids (about 90% of the near-Earth objects larger than 1 km in diameter have been found), but there is still a lot of work to be done with finding and tracking the smaller objects. Though it seemed enormous, the meteorite that struck Russia was relatively small. It's likely that objects like this could hit again without warning, simply because right now our satellite systems are combing the skies for truly deadly objects that could wipe out a country or even a continent. NASA is studying ways to improve the survey capabilities; an example of a prototype new system is the NEOWISE project that I worked on, which used an infrared telescope to discover and characterize NEOs. But the program has been expanded in budget by about a factor of 3 in the last couple of years, so that's good. One way that NEOWISE was helpful was that it could measure objects that appear dark to other telescopes. Often we judge the size of asteroids and meteors by measuring how bright and reflective they are. The problem is that some large objects are actually quite dark and very little light bounces off them. Using an infrared telescope like the one on NEOWISE helps us identify even these cloaked objects that might be invisible to other devices. In his new book Near Earth Objects: Finding Them Before They Find Us, JPL research scientist and head of NASA's NEO Program Office Donald Yeomans describes how the search for NEOs has gone from a "giggle factor" in the 1980s to several serious efforts at NASA, including the upcoming Planetary Defense Conference. NEOWISE is just one of several sky surveys the agency has undertaken. With the help of amateurs as well as professional astronomers all over the world, the agency is keeping track of thousands of NEOs and finding more every day. You may have noticed that the videos from Russia showed the object moving from the rising sun towards the west (or WSW), indicating that the object would have been lost in the atmosphere-inducing glare of the sun upon approach. Objects in orbits wholly, or partially inside the earths orbit can "blind-side" us, even when we search near-sun. We discovered 2008 TC3 just outside the lunar orbit some 20 hours before impact, and it was only 3-4 meters across, but it was near opposition from the sun. So it is not because it was too small to see, but because it was hard to observe. It would take more search telescopes to be able to scan the skies more often and catch everything incoming. If the atmospheric drag is enough, the aerodynamic pressure will exceed the strength of the impacting asteroid material. The asteroid will then disintegrate and its kinetic energy will be deposited into a relatively small volume of air. This air is strongly heated and expands very quickly to produce an explosion or airburst. The airburst then generates a powerful blast wave consisting of an abrupt pressure pulse followed by a substantial wind. An air blast can do far more ground damage than an object with the same energy that actually reaches the ground. When a meteorite is small enough that we don't see it coming, we should expect similar kinds of airburst disasters. In a few days, a small Canadian satellite will be launched from India called NEOSSat that will go into a polar orbit, and be able to observe the region 45 degrees from the sun without obscuration by our atmosphere. Designed to augment ground based surveys, we hope that this will find objects that might otherwise blind-side us. Are you an amateur astronomer who wants to help find asteroids? You can work with the new Target Asteroids! program, a project sponsored by NASA and University of Arizona.